(Reuters) - Goldman Sachs will limit loan growth in one of its new business areas if it sees a marked deterioration in credit quality, potentially jeopardising new Chief Executive David Solomon's task of boosting revenue by $5 billion by 2020. 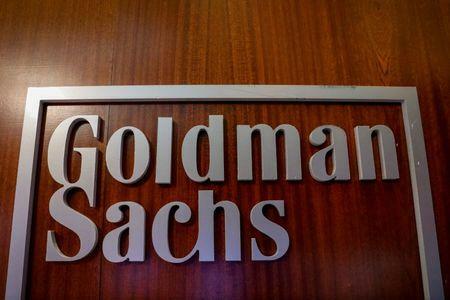 Stock trading and equity underwriting helped Goldman top profit estimates in the third quarter which was the first for Solomon who aims to reduce the bank's reliance on trading revenues after they were crimped by tougher regulations in the wake of the 2007-2009 financial crisis. A key part of the plan has been to deliver $1 billion in extra revenue from its new consumer banking business, Marcus, by 2020. Some analysts question how Marcus will be able to compete with rivals, such as Citigroup and JPMorgan Chase & Co which have full retail banks, without sacrificing credit quality. Goldman's incoming chief financial officer Stephen Scherr, who will take up the position in November, said the bank would slow Marcus's expansion if credit conditions deteriorate and borrowers show signs of defaulting in loans. "If, in fact, the market and the environment is not hospitable to us, we will watch it carefully, but not grow against the gale," he told analysts on a call on Tuesday. "We don't see that wind yet so we'll continue to grow." Rising wages and tax cuts have fuelled a U.S. consumer spending splurge, and Scherr, currently head of Goldman's consumer and commercial lending operation, acknowledged there are concerns the credit cycle is nearing a peak, although there was no "material evidence" conditions would take a turn for the worse. Marcus, launched in 2016, had handed out $4 billion in loans as of June 30, a number dwarfed by JP Morgan's $400 billion consumer loan book. Goldman Sachs said net earnings attributable to common shareholders rose to $2.45 billion, or $6.28 per share, in the third quarter ended Sept. 30, up from $2.04 billion, or $5.02 per share in the year-earlier period. Analysts on average were looking for $5.38 per share, according to I/B/E/S data from Refinitiv. Net revenue rose 3.8 percent to $8.65 billion. Equities trading revenue drove part of the beat, rising 8 percent to $1.79 billion. However, bond trading revenue fell 10 percent to $1.31 billion. Scherr will take over from current chief financial officer Marty Chavez as CFO on Nov. 5 when Chavez becomes co-head of Goldman's trading business. Shares of Goldman closed up 3.0 percent.